We are still just scratching the surface from the fallout resulting from the mishandling of evidence in alleged drug cases at the crime lab in Jamaica Plain. At the very least, the crisis we’re now facing underscores the importance of strict protocols and controls in every aspect of our criminal justice system. The massive effort to right the wrongs caused by what happened at the state drug lab is already underway. To his credit, Governor Patrick swiftly put together a central office to oversee the review of criminal cases potentially jeopardized by the mishandling of evidence. The office, headed by David Meier, worked throughout the weekend to identify cases where Annie Dookhan, the state chemist in question, performed primary or secondary tests. By Monday the estimate was that more than 1,100 individuals currently serving sentences in state or county houses of correction were affected. This number does not include individuals in federal custody, those awaiting trial, those on probation or parole, those who were previously convicted and served time, or those otherwise punished. In the last few days, a handful of defendants has already been released from prison or had their sentences suspended. It’s expected that in the coming weeks there will be an onslaught of people who will be released from jail or face significantly lesser charges. Calls are coming into the BBA’s Lawyer Referral Service on behalf of people imprisoned in drug cases. The Committee for Public Counsel Services has created a specific office to deal with the influx of cases. More information from CPCS can be obtained by calling their main number, (617) 482-6212. What’s happening in Massachusetts is unprecedented because of the magnitude of the number of cases potentially impacted. However, this isn’t the first time that state drug or crime labs have had to be shut done because of mishandling of evidence. In 2008, the Michigan State Police shut down the Detroit Police crime laboratory because of a history of mishandling evidence. In 2009, a San Francisco lab technician, who is currently facing federal charges, was accused of stealing cocaine from the facility and a total of 1,400 cases were reviewed. More recently in Nassau County, New York, the state crime lab acknowledged mismatching reports on blood-alcohol tests, as well as possible contamination of drug evidence. The local district attorney worked with the Nassau County Bar Association to help inform inmates whether their cases were impacted. As many as 9,000 drug cases were reviewed. It’s way too soon to assess what the impact will be on our justice system. But the scandal spotlights another important BBA public policy issue – the need to abolish mandatory minimum sentences. Currently, Massachusetts has a one-size-fits-all system of sentencing for drug crimes. Sentences are often disproportionate to the seriousness of the crime or the risk to the public. With few exceptions, Massachusetts’ drug-sentencing laws are based on the weight of drugs involved, rather than what a defendant actually did. This crisis is putting our criminal justice system to the test. While David Meier’s central office continues to work around the clock to identify those affected by what happened, it will be the justice system that determines whether or not we get it right. Just two months into Fiscal Year 2013 and the BBA is already gathering data, asking questions, developing our message and gearing up for our state budget advocacy for Fiscal Year 2014. As promised last year, advocacy efforts for access to justice issues are now a permanent and year round campaign for the BBA. State tax collections – not always the most accurate indicators – for these first two months are higher compared to the same period last year but are still below benchmarks. Traditionally the first two months of the fiscal year don’t meet benchmarks because they are typically small tax collection months. This isn’t alarming, but something to keep an eye on. In the event that tax revenue estimates need to be adjusted, line items across the board could be negatively affected. Here’s what we are hearing….. In our state courts, things are looking somewhat better than they did one year ago. After four years without a single new hire, the courts have finally filled about 64 assistant court officer positions. This will go a long way towards improving public safety, allowing proceedings to flow more smoothly, and providing some relief for overworked court personnel. In the area of civil legal aid, despite being severely underfunded, legal services providers continue to do some excellent work – such as helping families facing eviction retain housing, and securing unemployment benefits for low wage earners. Last year’s state appropriation for Massachusetts Legal Assistance Corporation was $12 million. While a modest increase over the previous year, the $12 million in state funding is not enough to address the growing need for civil legal aid. Traditionally a major source of funding for civil legal aid, Interest on Lawyers Trust Accounts (IOLTA), has plummeted in recent years, and continues to plummet. As you may know, reductions in IOLTA revenues are the direct result of falling interest rates. This makes the state appropriation all the more important. The Judiciary is still working to build their network of support both inside and outside of the state house and with business leaders. This is where the BBA can be of assistance. The BBA’s more than 10,000 members are also committed, interested and informed constituents gravely concerned about the impact that budget constraints have on the justice system. Our members see the effects of an underfunded justice system every day in their professional life and perhaps sometimes in their own personal lives. Our members can raise awareness by talking to their state representatives and state senators and telling them exactly what is going on inside Massachusetts’ courtrooms. Governor Patrick’s House 1 budget will be released on Wednesday, January 23rd. While that’s four months away, we are already planning to sit down with Secretary of Administration and Finance Jay Gonzalez and with Governor Patrick’s legal staff in the coming months. It’s important that they hear from the BBA because very few groups, aside from bar associations, care enough to advocate for the justice system. The 14th annual Walk to the Hill for Civil Legal Aid will be on Wednesday, January 30th at the State House. Nearly 700 attorneys came out last year, and we want to see even more lawyers to participate this January. Our partners at the Equal Justice Coalition are organizing letter campaigns to legislative leadership – with signatories to include Massachusetts law school deans, managing partners and general counsel of Massachusetts companies. Our annual visits with each of the chief justices of the Massachusetts state and federal courts are in full swing and will continue over the next few months. We plan to invite legislators to join us on visits to our local courthouses to see what’s going on at the ground level and in their districts. BBA members should plan to join us at Walk to the Hill on January 30th and should also be on the lookout for action alerts calling on them to contact key policymakers at crucial times in the budget process. It should come as no surprise that a one-size fits all approach to policy and advocacy doesn’t work for the BBA. The universe of issues on which the BBA could take a public position is limitless. In some ways, these issues exist on a continuum as illustrated below (click on the image to enlarge it). 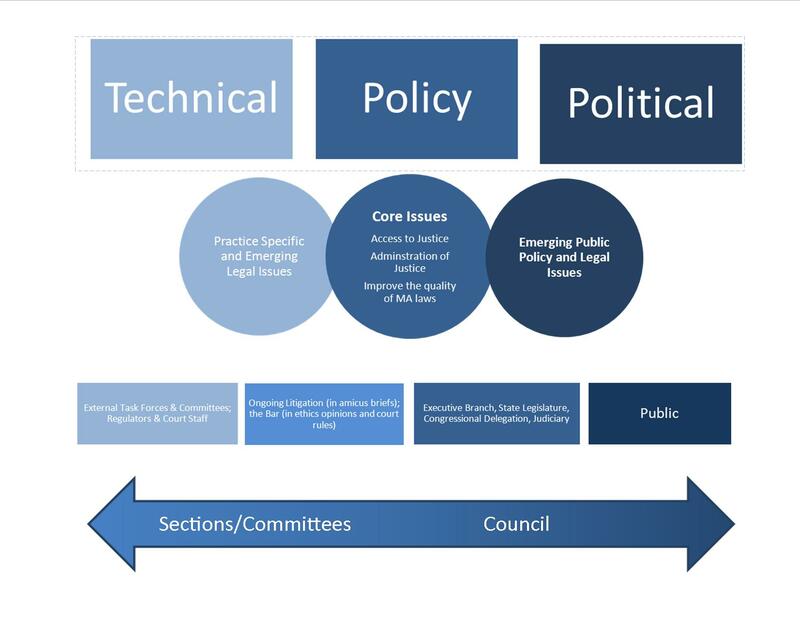 As issues move along that scale from technical to policy to political, the Council’s role increases. Our ability to be a leader on things that are timely, important and that resonate with our membership requires a process that is both flexible and practical. The primary consideration for determining whether or not the BBA will speak is how central the issue is to the three main tenets of our mission: access to justice, the administration of justice, and improving the quality of Massachusetts’ laws. The BBA is vocal on those issues that are central to our mission and more inclined to reserve judgment on issues that don’t clearly affect the practice of law or the legal profession. When the BBA does speak, the organization speaks on behalf of its more than 10,000 members unless explicitly stating otherwise. The manner in which we make our position known varies. We file amicus curiae briefs with the courts (see our amicus history), testify at public hearings on legislative issues, provide technical comments on proposed court rules, participate in official legislative task forces (see alimony), and meet with and write letters to key policy makers (see our NDAA letter to President Obama). The BBA’s Council agenda for September reflects the breadth of issues the BBA considers at any given time. Here’s a look at three items that are taking distinctly different internal paths at the BBA. As we noted last week, the Massachusetts Child Support Guidelines are undergoing a federally mandated quadrennial review. These Guidelines clearly affect the quality of our laws and the practice of law. These Guidelines and any changes to them is practice specific, directly affecting family law attorneys and their clients. Therefore, the BBA relies on the expertise of its Family Law Section and its Delivery of Legal Services Section (which is composed of many civil legal aid providers with experience in Probate and Family Court matters) to spearhead the BBA’s response. The Family Law Section solicited input from its membership and drafted comments and suggestions to be submitted to the Court. Though the comments still need to be reviewed by the BBA Council, the heavy lifting is done by our members at the section level. Back in August, the BBA filed an amicus brief in the Fisher case urging the Supreme Court to uphold race-conscious admission criteria. This issue originated in the BBA’s Diversity & Inclusion Section. Because of the BBA’s longstanding position that race-conscious admissions policies are vital to integrating the legal profession, we felt compelled to weigh in. The BBA’s Amicus Committee and a small group consisting of BBA Council members worked under an accelerated timeline to draft, recruit signatories and file the brief. The Supreme Court is expected to hear arguments in the case on October 10th. Last month news broke about egregious breaches in protocol at the Massachusetts drug lab, jeopardizing thousands of state and federal cases. The problems uncovered at the state lab clearly affect the administration of justice. This is so closely tied to our work in sentencing reform and touches on principles the BBA formulated in its Getting it Right: Improving the Accuracy and Reliability of the Criminal Justice System in Massachusetts. The BBA’s Council will determine if – and when – the BBA should develop a public policy position regarding the issues raised by the breaches. It’s September and that means the BBA’s program year has begun, and we are already off to a busy start. We welcomed our new president, J.D. Smeallie, and we have a full slate of things on the horizon. This year’s Annual Meeting is scheduled for September 21st at the Boston Sheraton Hotel. The event begins at 11:30 a.m. and features keynote speaker Senator Patrick Leahy . This former Vermont state prosecutor shares a common passion with the BBA – ensuring access to justice for all. He has championed several critical pieces of federal criminal justice reform legislation. The Senator’s work on these issues – particularly on the Justice for All Act of 2004 – has been essential to making our criminal justice system accessible to everyone. The Justice for All Act of 2004 is a comprehensive package of criminal justice reforms. Senator Leahy was instrumental in drafting the legislation in 2004 and getting it passed. He is so committed to this issue that he introduced legislation to reauthorize the criminal justice package last year. Under his leadership as Chair of the Senate Judiciary Committee, the reauthorization legislation passed the Senate in June 2012. One of Senator Leahy’s key contributions to the Justice for All Act of 2004 and the reauthorization legislation is the Innocence Protection Act. The Innocence Protection Act includes procedures for post-conviction DNA testing in federal court (sound familiar?). It also establishes the Bloodsworth Grant Program, which provides money to states to help offset the costs of post-conviction DNA testing. Now that Massachusetts passed the BBA’s legislation providing access to post-conviction DNA testing, we join the 48 other states that are eligible to apply for Bloodsworth funds. Senator Leahy’s work on these issues has gone a long way to ensure a more reliable system of forensic science and criminal justice. On September 27th, the BBA is hosting the Trial Court’s Child Support Guidelines Task Force. Since federal law requires that the Guidelines be reviewed every four years, the Task Force has opened a comment period and will hold hearings around the state. The Trial Court’s Task Force is being led by Chief Justice Paula Carey of the Probate and Family Court. The BBA’s Family Law Section reviewed the Guidelines and will submit its comments to the Trial Court’s Task Force for its consideration. The Guidelines are of tremendous importance to not only the legal community, but also to the public. Parents receiving child support, lawyers, judges, and others are concerned about the fair application of these Guidelines. Since non-custodial and custodial parents cannot always agree on what is enough support for their children, the Guidelines help ensure that children are adequately supported by their parents. The judges of the Trial Court use the Guidelines in setting orders for current child support, in deciding whether to approve agreements for child support, and when addressing the modification of existing orders. This month the new BBA president will start meeting with each of the Chief Justices of the Massachusetts state and federal courts. These meetings help the BBA understand the issues faced by members of the judiciary and frame our advocacy efforts for the year ahead. In recent years, court funding has been the major focus for our state courts as the Judiciary struggles meeting the demand for justice amid inadequate resources. The Supreme Judicial Court expects to release changes to both the Model Jury Instructions and Rules 12 and 29 of the Massachusetts Rules of Criminal Procedure – check out last month’s Issue Spot post for more information. Both SJC committees reviewing these rules are expected to meet this month. Further on the horizon, arguments in the Fisher v. University of Texas Supreme Court case are scheduled for October 10th. It promises to be a busy, but very challenging fall. Check back with Issue Spot to keep up to date with it all.